This past year has served as a reconfirmation of my belief that Sammy is a company with outstanding personnel. Sammy's strength lies in its explosive potential. By this I mean that when faced with a pivotal situation, personnel rapidly decide the course of action to take and make a concerted effort to accomplish their goal. The management policy of viewing personnel as its greatest asset, which Sammy has pursued since its foundation, has become firmly rooted into its corporate tradition. To further heighten Sammy's strength—which drives the SEGA SAMMY Group's growth—we concentrated on preparing foundations conducive to realizing this explosive potential. As part of these efforts, we created frameworks aimed at enhancing the capabilities of each employee, which we set out as a priority policy. As well as reforming a range of personnel systems, we developed foundations designed to realize "high-quality" cooperation. Our reforms of operational processes have realized benefits throughout the company, and I intend to continue dialogues with employees in this regard. Meanwhile, several problems related to business results came to light during the fiscal year that we have to address. These include the postponement of the launches of pachislot machines and pachinko machine sales that were below target. 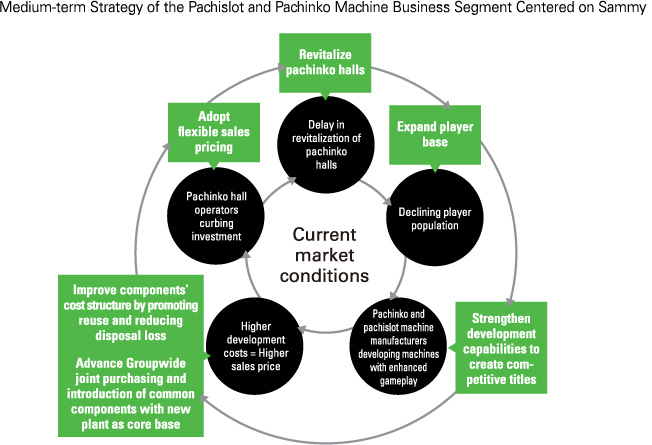 Conditions in the pachinko and pachislot machine market remain tough. In particular, we need long-term initiatives to tackle the structural problem of a declining player population, resulting from a young generation that tends not to visit pachinko halls. This decline in player population is affecting the business results of pachinko hall operators materially. Deteriorating business results have led pachinko hall operators to curb capital investment and the replacement of old machines and to seek reliable returns on the limited funds they have to invest. As a result, demand tends to focus on the most popular titles. For the same reason, sales of pachinko and pachislot machines are subject to cyclical peaks and troughs. 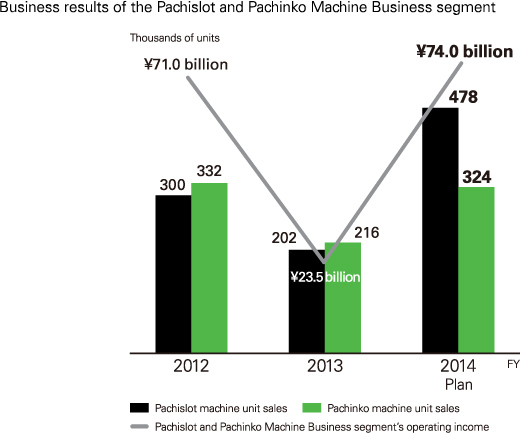 In fiscal 2013, in the market as a whole, pachinko machine unit sales decreased slightly from the previous fiscal year, to roughly 2.5 million units. However, due to the pronounced market bias toward popular titles, our pachinko machine unit sales were down 30%, falling short of our target. Meanwhile, on the manufacturing side, we are working to broaden the player base by developing machines with weaker gambling elements and heightened gameplay, but this is pushing up development and production costs. In other words, we have reached a paradoxical situation in which by seeking further quality we place greater burden on pachinko hall operators. I believe that resolving this problem is critical for further development of the industry. The polarization between manufacturers that have popular titles and those that do not is becoming even more marked. As such, in fiscal 2014 we want to ensure our position among the group of winners by launching several competitive products. In the current fiscal year, the Group's first priority is to recapture the leading share of the pachislot machine market. Accordingly, we aim to increase sales versus fiscal 2013 about 2.4 times, to 478,000 units. As for pachinko machines, we plan to restore our market presence by growing sales 50% year on year, to 324,000 units. After achieving this, we will set our sights on claiming the No. 1 share of the pachinko machine market. These are by no means low targets. However, we plan to bring to market several titles in which we have confidence. Above all else, we want to reach these targets and realize a v-shaped recovery. In the medium term, we will expand the player base by developing even better products tailored to the preferences of each generation. Already, we have begun developing products based on in-depth market analysis of respective generations. Also, with regard to the problem of the postponement of the launches of pachislot machines, we intend to develop low-cost supplementary machines in readiness for contingencies. Continuing the trend of fiscal 2013, R&D expenses are likely to rise more than 20% year on year in fiscal 2014. Please understand that this reflects our determination to create an unceasing series of competitive products and thereby remain among the winning companies. It goes without saying that we have no intention of recklessly increasing the number of titles. Instead, we will narrow down our lineup to titles that accurately reflect demand and pursue development efficiency. Our multibrand strategy has already realized certain benefits by providing us with more business opportunities. Going forward, however, we want to establish this strategy as an even clearer advantage. Among these efforts, an important task will be raising the base level of TAIYO ELEC Co., Ltd., which became a wholly owned subsidiary in fiscal 2012. If we can rejuvenate this company and grow its sales and earnings to a size comparable with Sammy's, I believe our target of carving out the largest share of the pachinko machine market will come within reach naturally. We have already incorporated systems that facilitate collaboration by sending development teams to the company and by enabling joint development. While their effect will take some time to emerge, we are moving forward with these measures steadily. Heightening the reuse rate is one measure that addresses the challenge of creating appealing products while curbing costs. To realize this measure, introducing joint purchasing and common components among the Group companies that comprise our multibrand strategy is key. Playing a central role in these efforts is our leading-edge plant, which started up operations in September 2012. Already, we have begun joint purchasing of components. And, while promoting design collaboration, we intend to introduce common components. Once these two measures become entrenched, we will be able to realize unified management of components centered on Sammy and advance wide-ranging component reuse. Achieving improvements in manufacturing costs and exploiting the resources acquired from reducing disposal loss will enable us to secure adequate earnings while implementing flexible sales strategies. This will help resolve the problems I mentioned earlier. Therefore, we will forge ahead with these measures to establish indisputable standing as a member of the winning companies' group.